Yesterday was like a dream. As bad as Wigan were – and they were abject – it was destined to be Blackpool’s day. To be top of the league for just three hours was more than I could ever have hoped for in years gone by, so it was fun to savour it while it lasted. Based on the performance at the DW Stadium, it seems like Holloway will take the same approach as we did last season and attack teams. It’s a strategy to be applauded. In terms of individual quality, we stand in the shadows of every other team in the league. Even Wigan spent £7m on a single player in pre-season. If we go defensive in this league, other sides will have the technical ability to unlock the door. By adopting such a progressive system, we may well give ourselves a chance in the so-called ‘best league in the world’. Of course, harder days lie ahead, but this win should help the team maintain their belief and their confidence. Already we have matched the number of away wins Burnley managed all season, and the total number of wins Derby achieved in their record-breaking season of an all-time low number of points. Onwards to Arsenal next week, where there’s every chance we may get beat 7-0. 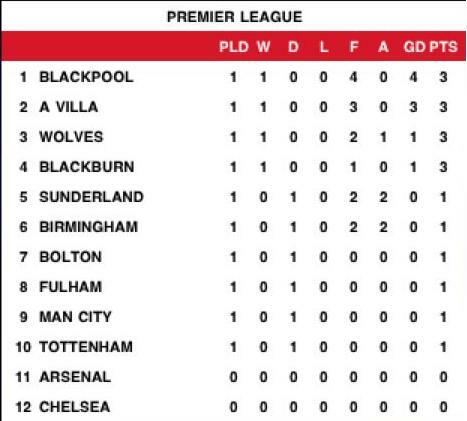 For now, the Seasiders are occupying a Champions League spot. Can we end the season now, please?